01 Jan Marrakech airport: new terminal. Marrakech airport: finished the new terminal . Marrakech Airport has just completed its remodeling and has increased its passenger capacity by about 200% with a new terminal. 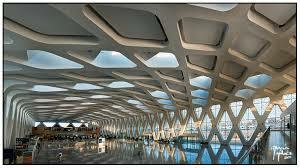 This new terminal was inaugurated by the King of Morocco, Mohamed VI on 25 December. The facilities at the new terminal include a boarding lounge, a baggage claim area, a public area covered by a glass dome, private lounges, a shopping area and commercial establishments, as well as a parking lot with capacity for more than 1,500 vehicles. Marrakech Menara Airport is more than just an airport, it’s a time machine. When you step outside our 21st century airport, you’ll enter a city where classical traditions of the arts, crafts, music, and food are as vibrant today as they were centuries ago. Direct flights connect Marrakech with cities throughout Europe, and from there to the world. In 2010, the airport will serve over three million passengers. We sincerely hope you will be one of them.